I’m a huge fan of Nava Atlas and her site Veg Kitchen. 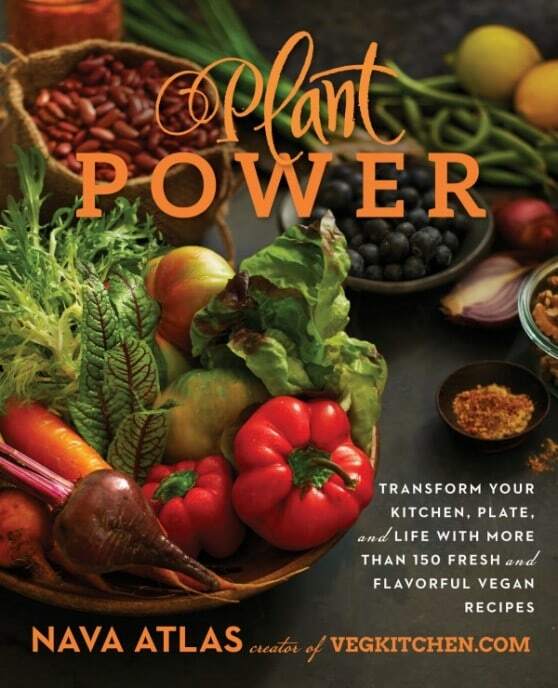 Her publisher sent me a copy of her latest book, Plant Power, to take a look at. Spoiler: It’s full of easy to make delicious vegan recipes. Be sure to scroll to the bottom of this post and enter for a chance to win a copy of your own. The book is broken down into 2 parts. The first part is Plan Powered Living where Nava goes over the benefits and myths of a plant based diet. She also gives you the info on how to set up your pantry and how to store produce. If you live in a mixed household like I do, there are some tips for you too! 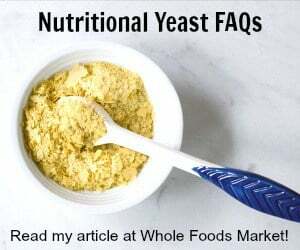 All the recipes are simple, wholesome and very few have any kind of processed ingredients. Many of the recipes have no oil added options and/or gluten-free, so this book is great for many special diets too. 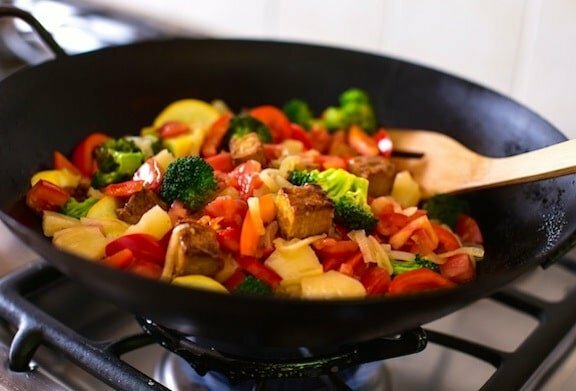 This sweet-and-sour stir-fry, featuring high-protein seitan or tempeh along with colorful vegetables and pineapple, has several steps but can be made easily and at a leisurely pace. Best of all, it results in a delicious and nourishing meal. This is especially good served over bean-thread noodles or Asian brown rice vermicelli, but soba or udon work well, too. Long-grain brown rice and brown basmati rice are good choices as well. Stir in the zucchini and stir-fry just until everything is tender-crisp, about 2 minutes longer, then stir in the tomatoes and pineapple chunks. Stir in the sauce and cook until it thickens. Taste and adjust the sweet-sour balance with more agave and/or vinegar (as called for in the sauce recipe) to your liking. Serve at once over hot cooked grains or noodles. Pass around any of the optional items for topping individual portions. Why a pound of seitan but just 8 ounces of tempeh? Seitan is more moist and less dense; a pound of tempeh would be quite intense in this dish. But if you’re a big fan of tempeh and want a higher-protein dish, go for it—use two 8-ounce packages. We love having baked potatoes with Chili poured over them. Perfect way to use a slow cooker. Looks like some great recipies. Egyptian rice and red lentil soup with spinach. love the leftovers for lunch. When I am short on time….baked sweet potato topped with salsa and a salad or salsa over brown rice and a salad. 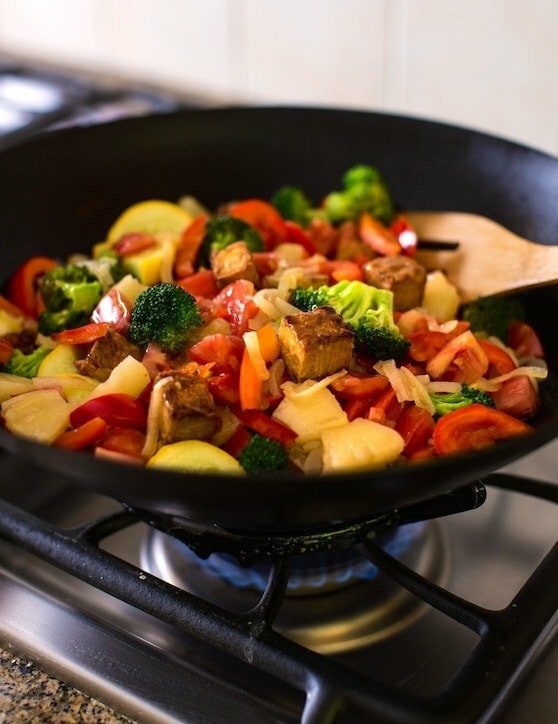 My favorite weeknight dinner is some sort of stirfry … so many different ways to make it, to keep it new and exciting! Fajitas …but right now it’s perfect weather for soups and chilis. This is “what’s for dinner” tonight! Plant Power is going to end up on my cookbook shelf one way or another. Looks like another fabulous collection from Atlas. When in a pinch for time, I often whip up vegan chipotle mac & cheese with broccolini! Thank you for all the great ideas. I love your book The Great Vegan Bean Book. I put it away for most of the summer but it’s back on the kitchen counter! I do enjoy her other cookbooks! Our family weekend night dinner is chicken stirfry. A rice bowl or salad with beans added. Build-your-own bean burritos and whatever leftovers we happen to have around. Thank you for the giveaway! Baked potatoes with salsa, or chili, or veggie stew on top. I need to check this out. I’m vegetarian (not vegan) and I’m always on the lookout for new recipes and veggie cookbooks. This sounds excellent! My favorite go-to right now is a quinoa vegetarian chili. I can cook it way ahead of time and re-heat for 2 – 3 days if needed. It only takes 20-30 minutes so it’s a favorite during the cool months. A big Dr. Fuhrman type salad! a big salad or soup! My favorite goto weekend meal is a gf tortilla pizza with Diya cheese and lots of local veggies! Sandwiches, tostadas or veggie burgers. My favorite go-to weeknight dinner is a big bowl of soup full of veggies. Yummm !!! taco night. we do taco tuesdays! salad with some beans and roasted veggies along w/ home baked bread spread w/ nut butter. I always have lentils on hand to put in a veggie stew, usually with potatoes, onions, and carrots, which I also usually have on hand. Can’t beat lentils for their protein and fiber if you just haven’t had time to plan a quick, inexpensive weekend meal. Ny go-to dinner is refried beans, sauteed peppers and onions, basmati rice, salsa, and avocado. Yum! Great recipes! Spaghetti with sauce. Pasta – various kinds, with various sauces. So easy! Pasta, it is quick and easy. Taco salad, we had it last night! A veggie soup with beans and or pasta. Broccoli & cauliflower ( 1lb (from frozen) of each) with nutritional yeast and Bragg liquid aminos. Refried beans on corn tortillas with what ever veggies I have. Rice, greens, mushrooms, and beans, tofu or seitan is one of my favorite meals. So many fun options… depends on just how rushed a weeknight it is. Really really rushed? Frozen cheese pizza with a crumble black bean burger on top. Otherwise, a homemade pizza… or homemade nachos with a vegan cheesy sauce… or saucy tofu with greens and a grain. Oh my this looks amazing, all those colors!!!!! Usually a pasta dish is a quick go-to for our family. I’d love to win this cookbook! Thanks for the opportunity! This time of year, soup salad and bread is the meal we eat the most. My favorite go-to weeknight dinner is what we call EWYG! That stands for Eat What Ya Got … and yes, we know that is not proper grammar! 🙂 It is a funny way to say “look in the fridge and take account of what is there and find a creative way to prepare it or mix it together or combine leftovers, etc” Tonight’s dinner was EWYG – we had cherry tomatoes, onion, garlic, spinach and corn, so they were lightly sautéed and served over leftover baked potatoes. YUM! I usually make something like chili or another similar dish! I love making vegan BLT’s…theyre so satisfying! We love variety; so it’s hard to pick a favorite; one thing that’s always on the menu is a large salad with plenty of greens. We especially like vegan Caeser salads with very garlicky croutons. Our big meal is in the middle of the day…and my go to is bean enchiladas with verde sauce and rice. Even our 6, 4, and 2 yo love it! My husband and I are on a kick of stir-frys with a ton of veggies, tofu, and a peanut sauce for dinner. Tacos are my latest favorite. Many thanks! A veggie filled lentil soup with a crusty bread. We also like it over a baked sweet potato or tossed with a chunky whole wheat pasta and some grated Parmesan cheese. I have been using up the last of the tomatoes from the garden and I like to toss chopped tomatoes with avocado, black beans, quinoa and any other veggies that sound good for a quick dinner.